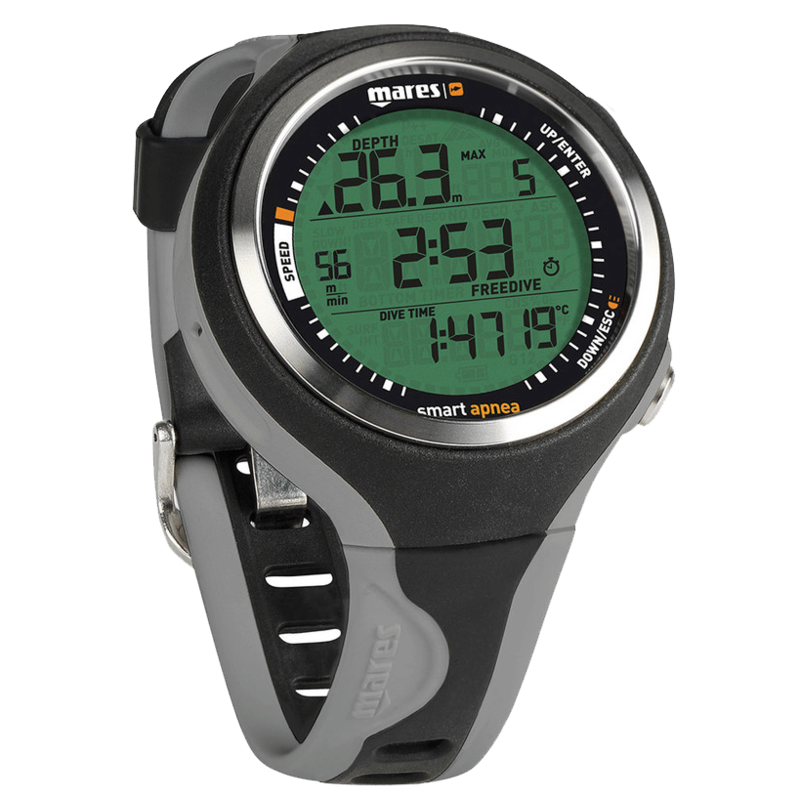 The Mares Smart dive computer is a fully functioning watch, with a stopwatch, wake-up alarm, second time zone, and date functions, available in a variety of fashionable colors. It is also a fully functional entry-level dive computer, with the all basic features that beginning scuba divers and free divers rely upon. It’s sporty enough to wear every day but has the features and performance to keep you safe on a dive. The attractive, streamlined Mares Smart offers all the basic functions of a dive computer in a package compact enough to wear every day and does it at an incredible price. Who is the Mares Smart Designed For? Below is a video overview of the computer done by the guys over at SimplyScuba.com. In the video, you can get a closer look at some of the features and functions of the dive computer. More advanced dive computers allow more sophisticated switching, and the Mares Smart only allows two. However, it’s a fantastic way for beginners to learn and practice, without getting confused or overly complicated. Many beginner dive computers don’t have gas switching capabilities at all, so it’s nice to see in the Mares Smart. You can set decompression and altitude settings at standard, intermediate, or conservative, to customize your dive plan and maximize dive time safely. It’s definitely an attractive dive computer, and can be comfortably worn as a watch, but the segmented display feels a little old-fashioned. Two button navigating is a little slow. Good choice of diving modes and the ability to switch gasses is great. On-board memory is small, and it’s easy to accidentally trigger a 24 hour lockout. Strong features for the price. The Mares Smart has all the necessary features in a clean, easy-to-read display, with simple menu navigation. It’s designed to keep beginning divers safe without creating confusion or offering too many options, and packaged in a watch attractive enough to be a sports watch for daily wear. The price on the Mares Smart is incredibly affordable, making it even more appealing to a beginner. It’s a fantastic entry point into dive computers, and a great device to learn and practice on until a beginner is ready for an upgrade. With a dive watch this handsome, that day may be a while. When worn constantly as a watch, the backlight features will drain the battery faster than the 2-3 years projected by Mares. Anticipate changing the battery once a year or more unless you actively take steps to conserve battery life. While the battery is user-replaceable, it is difficult for a person to correctly re-set the seals, and a few people have encountered leaks. It may be smarter to have it done by a professional. The two-button operation streamlines the design, but it can take a long time to navigate menus and sub-menus. While the ascent rate lockout is a good safety feature, beginners should be careful when using free dive mode. If free dive mode is enabled incorrectly, it can unexpectedly lock the device for 24 hours, when the Mares Smart thinks that scuba and free diving are being done consecutively. The onboard log is only 25 hours or 20 dives, which isn’t a lot of onboard memory compared to competitor products. This product is definitely for entry-level divers. It keeps all the necessary information available in a compact, easy-to-read display. It doesn’t provide a lot of extra information or features that may confuse new divers, and it’s attractive and easy to use. More advanced divers who are accustomed to more information, larger dive logs, and more customization options won’t be happy with the Mares Smart, but it’s not made for them. It’s an entry-level dive computer, with a very accessible price. Can the units be switched on this dive computer? Yes, it can be switched from metric to imperial units or vice versa, including temperature from Celsius to Fahrenheit. Can this computer be used as a daily watch? Yes, you can use this computer as a day-to-day watch. The Mares Smart may have some durability concerns, and some people do accidentally ruin it when replacing the battery. It’s a good entry-level dive computer, an attractive design at an attractive price, but expect to need to replace it or upgrade to a more feature-rich dive computer within a year or two. Buy it with lowered expectations, or spend a little more on a more durable dive computer.